Bolidt is celebrating a decade of success for Bolideck® Future Teak, the environmentally friendly and realistic alternative to traditional teak decking that continues to be the preferred choice for cruise ship owners and designers. This year marks the tenth anniversary of the launch of the ground-breaking synthetic decking material, Bolideck Future Teak. Since its introduction in 2005, it has become a firm favourite amongst cruise ship operators and designers in particular and the company’s present order book demonstrates that there has been no let-up in demand. "Bolideck Future Teak remains the product of choice for cruise ship operators and shipbuilding yards, as well as specialist designers. This reflects the fact that it is a cost effective and sustainable alternative to natural teak," says Jacco van Overbeek, Bolidt maritime division director. 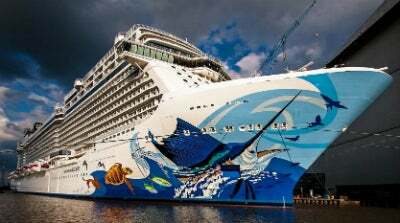 Long-term supporter Norwegian Cruise Line (NCL) specified extensive use of Bolideck Future Teak for the 164,000gt, 4,200 passenger capacity Norwegian Escape, the first ‘Breakaway Plus’ vessel due to be delivered from Meyer Werft in October. In total, Bolidt will supply 15,000m² of exterior decking for Norwegian Escape, with Bolideck 525 and Bolideck Select Soft featuring alongside Bolideck Future Teak. Bolidt is also supplying decking materials for 4,500m² of balcony space and interior public areas. Mr Van Overbeek says: "NCL is using Bolideck products on all its cruise ships and we have known each other a long time. The reason they place contracts with us is that we are focused on solving problems, have nice designs and are very flexible. Collaboration with their designers is great and if they have an idea or a new concept we create samples until they get what they are looking for." Another repeat Bolideck Future Teak customer is Royal Caribbean International (RCI), which has confirmed a contract for 18,000m² of decking for the 5,479 passenger Harmony of the Seas. Bolideck Future Teak will cover the outer decks of the luxury cruise ship, with Bolideck Select Soft featuring ipublic areas inside. Bolidt is also delivering Bolideck Select Hard for swimming pools and Bolideck Helideck for the helicopter landing platform. The 226,000gt Harmony of the Seas is due for delivery from STX France in April 2016. Robert Levash, associate at Royal Caribbean’s long-time designers, Wilson Butler Architects, says: "Bolidt was chosen because its products have been proven on many Royal Caribbean ships. Benefits include quick installation and limited maintenance, while there are endless colour selections and different types of finishes that designers can have at their disposal." It is clear that Wilson Butler Associates enjoyed working with Bolidt. Mr Levash continues: " Bolidt thrives on working with designers in order to achieve their visions. If there is a complex flooring design, they look at finding the means to fabricate the desired end product. Overall Bolidt been a great partner both to the yard and the design team." Bolidt products are also to be found on-board Koningsdam, the completely new Holland America Line vessel type due for delivery from Fincantieri’s Marghera yard in 2016, with novel design features developed by architects Adam D TIhany and Yran & Storbraaten. The largest vessel in the HAL fleet, at 99,500 gt and 2,650 passenger capacity, Koningsdam will feature 4,700m² of Bolideck Future Teak on the outer decks. In addition, orders for cruise ship refits are strong, according to Van Overbeek, who reports that AidaDiva was fitted out with 550m² of Bolideck Future Teak and 180m² of Bolideck Select Soft during a recent refit at Blohm + Voss. He continues: "The HAL vessel Amsterdam also received 900m² during an upgrade at Grand Bahama Shipyard earlier this year, while the recent upgrade to Carnival Victory included installation of 3,625m² of Bolideck Future Teak. Ease of installation during retrofitting has created a key growth opportunity for Bolideck Future Teak." Bolideck Future Teak is a durable and lightweight synthetic decking system, which looks and feels much like real teak. It allows designers to deliver the high-end quality ambience required on-board a cruise ship at the same time as being ecologically responsible and easy to maintain.